After you watch the video, if you can think of a specific song (Title and Artist) that you know works well with that strum pattern, put it in the comments below. By the time we’re done, we should have a nice long list of songs that we should all be able to play fairly easily. Sounds like the opening of a joke, Griff…. Two chords in a bar. The I chord says…. Wonderful Tonight by Eric Clapton G D C D slower tempo. it work’s! Get the spiral bound edition and you will love it! I haven’t tried it yet, but I *think* Melissa by the Allman Brothers would sound ok with this strumming pattern. What kind of strings do you recommend for a acoustic guitar? I have Ernie Ball super slinky on my electric. But need to change strings on my acoustic. Hey Jane, if you’re using Super Slinky’s on your electric, I’d say just use Regular Slinky’s on your acoustic. I’ve been using EB Reg.Slinky’s on my 1972 Maton FG100 dreadnaught probably since the guitar was brand new. I also used Tomastik-Infeld strings for a long time on other acoustics, but I don’t know whether you can get them any more – we used to call them “Doctor Tomastik”. Both the EB Regulars and the Tomastik’s have 10-gauge first strings. I think your Supers are 9-gauge? BUT, the Regular Slinky’s are definitely heavier than your Supers, so be ready for sore fingers if you put them on your acoustic – especially if the action on the acoustic is higher than your electric. I have used 9-gauge string sets on acoustic guitars, but they tend to rattle a bit, and they are not very loud, so I quit using them. I also use EB Regular Slinky’s on my Epiphone DOT so I don’t notice the difference between playing the electric and the acoustic. Take it Easy by the Eagles. 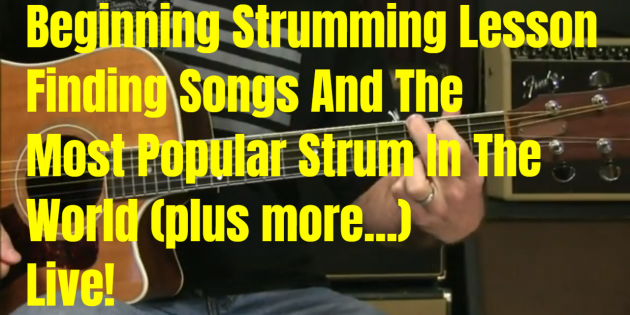 I’v been doing the Most Popular Strum in the world for years and I didn’t know it. Thank you Griff for all of your fantastic lessons. Great stuff Griff! When was the live video done? Sorry I missed it. I’m disappointed you don’t know Devil In Her Heart and Carl Perkin’s Honey Don’t.